How much money can my roof make? 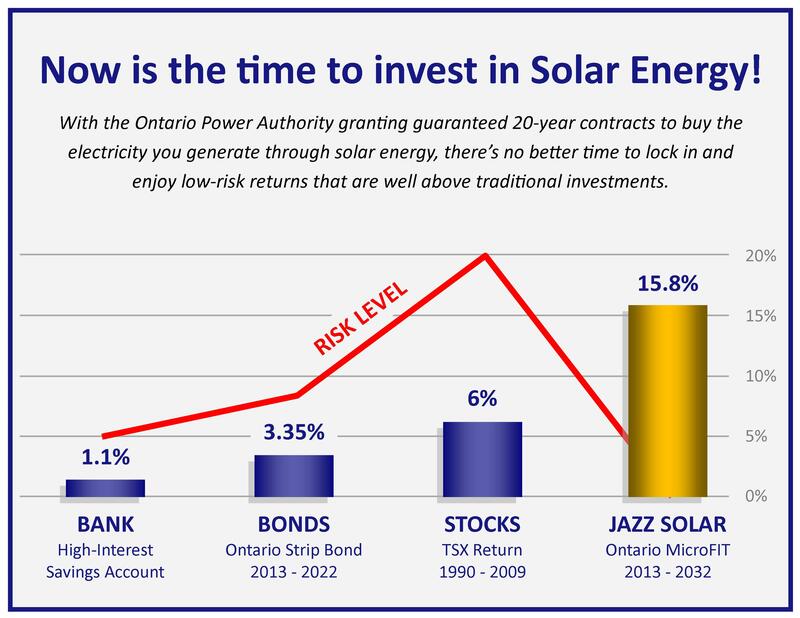 The Ontario Power Authority (OPA) established the the microFIT program for solar PV systems up to 10 kW in size for residential homes. For systems that are roof mounted, the OPA PAYS you an unprecedented rate of almost 40¢/kWh, guaranteed for the next 20 years, for all of the solar electricity that you produce! Install JAZZ Solar on your roof. And start getting guaranteed monthly cheques! How many investment vehicles do you know of that can provide above average returns while offering virtually no risk? Investments of this type are literally unheard of. We all know that lower risk investments offer lower yields. Savings bonds for example offer a low return on investment in return for being very safe and preserving your capital. At the other end of the spectrum, high risk stocks and investment instruments like derivatives offer the opportunity for large returns, but at a correspondingly high risk. Your investment could quickly turn into a loss or even evaporate completely. Think of the technology bubble in the early 2000’s where billions of investment dollars were wiped out when the markets tanked. An OPA microFIT contract is a 20-year binding agreement that specifies a guaranteed rate for the purchase of the electricity you generate. And while the returns you generate will vary with system size and site conditions, the returns will outperform most investment vehicles while minimizing the risk of losing your initial investment. Click here to learn more about the return on your investment. Act now to lock in your investment! With over 44,000 households already signed up, this deal won’t last long!